Fast enough on the road to get to your job when you need it, our Franna pick and carry cranes do just what they promise: lift your load and enable you to shift it around even in cramped conditions. With an articulated frame that doesn’t require outriggers, you won’t waste time setting up, either. This Franna is a multipurpose crane fit for a broad spread of projects. 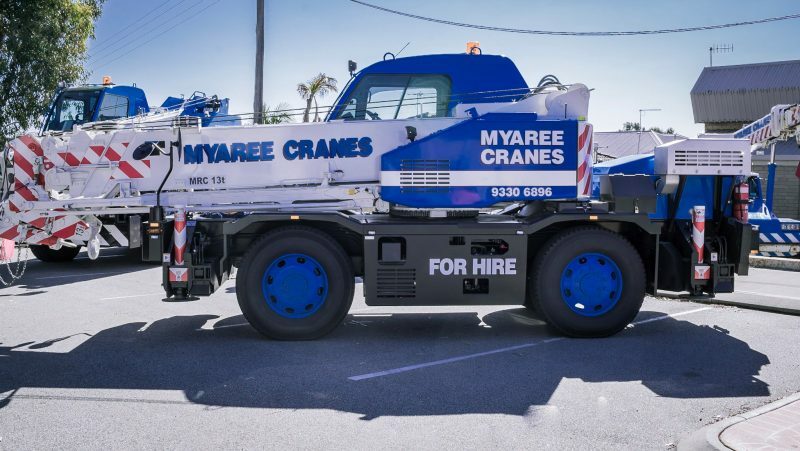 Of all the crane hire companies in Perth, Myaree is the place to rent your Franna Crane. Franna cranes like our AT15-3 have a 15T capacity at a radius of 1.4m, giving you a perfect combination of manoeuvrability and performance while also enabling you to lift heavy loads across a variety of applications, from the construction site to the factory and everywhere in between. Franna Cranes are handy and versatile for a whole range of purposes and industries, in particular, the Marine Industry. For example, the Franna Crane can pick and carry loads up to 2500kg on a single winch line. Our expert crane operator will simply remove the “hook-block” off the winch rope. With this simple adjustment, you can maneuver engines, gearboxes, gensets or any heavy object into tight locations which was not previously achievable. Franna Crane Hire Perth – the perfect pick and carry mobile crane. For construction site lifting, Franna cranes deliver fully. As all-terrain cranes, they’ll go just about anywhere, even if the ground is patchy, rocky, or downright uneven. Frannas are a smart choice for crane hire if your site has awkward access. For a winning mixture of maneuverability and raw lifting power, our AT15-3 is just the ticket. Bricks, timber, pre-cast steel, timber beams – if you’ve got it on site, our Franna crane will hoist it up where you want it. If you have even more ambitious needs in a commercial setting, Franna cranes work equally well if you’re a farmer or a manufacturer, or if you’re undertaking any kind of large-scale erection. With one of our skilled operators at the controls or one of your own drivers in place, we’ll dispatch our Franna Crane, capable of travelling at pace on the road, to get the job done in no time. For all your marine needs, from maintenance to lifting your boat or yacht into the water, our Franna Cranes are absolutely ideal. For more than three decades, Myaree has been lifting heavy materials on construction sites throughout Perth. We specialise in dual lifting as well, so if you think the load you have in mind is particularly unwieldy, let us know and we’ll dispatch a single crane or multiple cranes depending on what our lifting assessment unveils. One of the key advantages of choosing Myaree Crane Services is the fact you’ll get all the personal warmth of a family run company coupled with the resources and experience of a larger firm. You get safe, swift service with a smile, a rarity in today’s marketplace and something we’re proud of. Additionally, our crane hire rates are among the most competitive you’ll find. Every Myaree operative is fully licenced to carry out high-risk work. All our projects are conducted in compliance with 1996 OHSE regulations. With Myaree, we get the job done safely, on time, and within budget so you can relax and get on with what you do best. While we strive to establish ongoing relationships, we’re more than happy to turn up for a small one-off job, too. We understand all our customers have differing needs, and we’ll do our very best to accommodate. Longstanding marine maintenance projects on prestigious vessels show our commitment to ongoing customer care. Once you’ve used Myaree once, you’re highly likely to use us again. Give us a call or drop us an email about crane hire in Perth. Whether you need Perth city cranes or a slewing crane for hire, we have the machinery to meet your needs.